This is part 2 of our ‘What is Strokes Gained’ series. To view the first part, click here. This stat measures if a golfer hit the fairway or not, but fails to account for the distance difference. You still get a fairway hit in regulation if you hit a pitching wedge 150 yards on the fairway, and as such it is worth exactly the same as a 300 yard drive in the fairway, but most people would agree that the 300 yard drive is a lot better, because it leaves you with an easier next shot. The severity of the missed fairways simply omitted. A golfer can hit a 300 yard drive one inch out in the rough, and it’s a missed fairway; the golfer can also hit a shot out of bounds – it too counts the same – as a missed fairway. In a similar way as with driving accuracy, the greens hit in regulation statistic doesn’t account for the distance you hit the ball from the actual flag. An approach shot hit to 100 feet is worth as much as an approach shot hit to 1 inch, but the golfers is way more likely to make the 1ft putt than the 100 foot putt. The severity of the missed green isn’t accounted for. If you miss the green by 1 inch but you are perhaps only 3 yards from the hole, this is a really good shot! If you instead hit your approach shot in a water hazard, this is incredibly bad, but in terms of greens hit in regulation, they are worth the same – a miss. A player hits all 18 greens in regulation, but each first putt on the green is 100ft. He two putts all of them for 36 putts in total for the round. A player hits all 18 greens in regulation; 9 of which the first putt is 100 feet and he two-putts those; 9 of which he hits to 1ft and makes all of them.Which player had the best putting day? It was actually the first player, despite having 36 putts, and the reason is that it depends on how difficult the particular shot is. Everyone makes almost all 1foot putts, so missing one of those is really bad. Very few people make 100ft putts, and it is really good to 2-putt those. Therefore, the first player had a better putting day, and this leads us to the next part in understanding how Strokes Gained works: expected score. 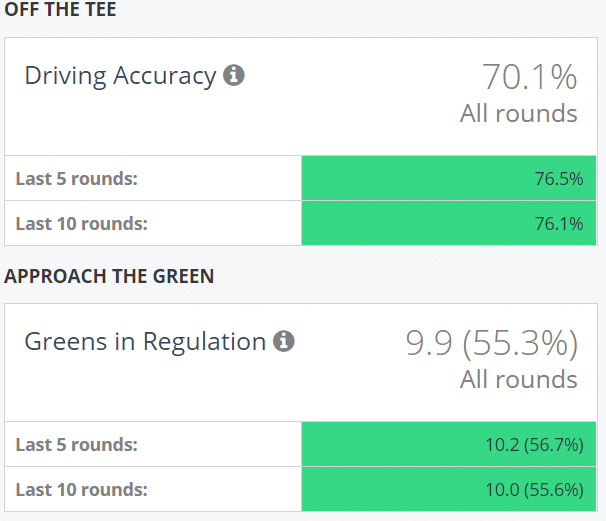 In this section, we will introduce the modern way of thinking about your golf performances, and it is to use your Expected Score to make decisions. Your Expected Score is the number of strokes it normally takes you to finish a hole from a particular distance and lie. When playing a round of golf, we have an instinctive way of dealing with ‘Expected Score’ without thinking about it: some lies we get on the course are perceived to be more ‘difficult’ than others lies, who are thought about being ‘easier’. So what is an easy shot, and what is a difficult shot? Stay tuned for the next part of this series, where we look in detail on what the real differences are between difficult and easy shots.